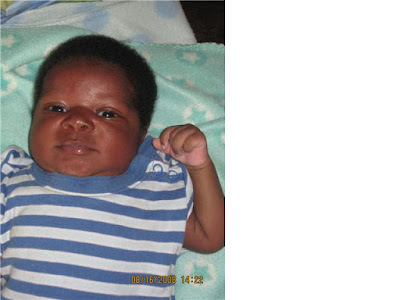 On August 1st, two days after our triplets came, we received a nine-day-old baby boy, Jean Kendy (pronounced Kendzy). Jean's mother died and he was immediately brought to us. It is always sad when a child loses their mother but particularly so in this case because Jean's daddy had lost his first wife 12 years ago and had to give up his daughter to me at that time. The poor man is so distraught. I can't even imagine his grief going through this a second time. Jean Kendy was not very well when he came. He was very yellow with jaundice, was dehydrated, and a bit lethargic. He is doing much better now and is a normal five-week-old. 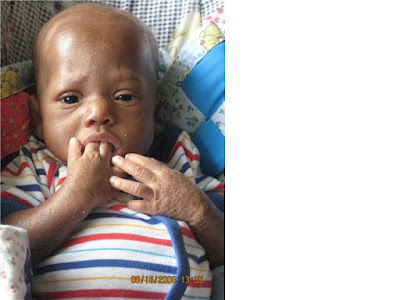 Five days after Jean Kendy arrived, Adam arrived at two-weeks-old. Adam was already a strapping 7lb 6 oz little guy, which is huge for the newborns we usually receive. He has a darling, chubby face, a big appetite, and a thick head of hair. He is doing very well. On August 12th, we received another newborn, Pierre. He was rushed here immediately from the hospital. He arrived at our door not breathing. On further assessment we realized that he had experienced a very traumatic birth, which was later confirmed by the doctor. 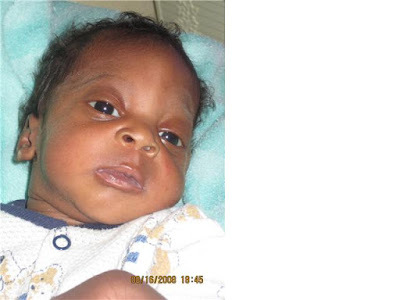 The mother lived an hour and a half away and was unable to receive adequate medical care. We did all we could for him, and worked for four hours trying to get him to breathe but it became obvious that there was nothing we could do. When we looked at the clock and saw it had been four hours and Melinda was still breathing for him, we put down the ambu bag (used to provide rescue breathing) and laid our hands on him and prayed. We asked God for mercy, either healing on this earth immediately or healing in heaven immediately. Little Pierre was gone by the time we opened our eyes. Melinda made the very difficult call to the doctor and the grandmother soon came. We buried Pierre in our private cemetary the next morning in the presence of several neighbors and family members. It was sad but we were glad that he was in heaven, free from pain and laying in the arms of the Savior and completely healed. Alyssa is doing very well at the moment, despite having numerous illnesses since birth, including skin infections. She has also been on IVs off and on. At present she is doing very well. She turned three-months-old last Sunday. She is still small for her age. Carlos' hemoglobin has come from a level 2 to the current level of 12. He is doing amazingly well for as sick as he was. In the last two months, his development has been great, despite the neurological damage he has which the doctor has advised is permanent. What can we say about Steeven? He is slowly making progress. His skin seems to be clearing up little by little. He is holding his head up more consistently on his own. We are exercising his extremities every day. He now reaches for toys hanging from his play-gym. He is eating some semi-blended food and overall is doing well. One of his continuing problems is constipation and being able to relieve himself on his own. He has to have frequent enemas or suppositories in order to avoid pressure on his abdomen and the resulting pain. He occasionally laughs and does make eye contact with us now, which he did not do before. We are very pleased with his progress. As you may remember, RoseLisa is the little girl with crippled legs. She was very sick with dehydration when she came. She has gained weight and is now doing very, very well. She is sitting and playing with the other children, and has finally become accustomed to her bedtime routine. Her mother comes every evening to play with her and put her to bed, and is learning to care for her special needs. 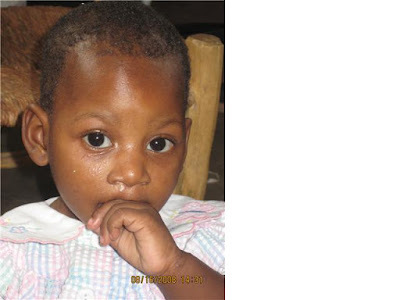 We are very, very happy to have received news from Lori that she has found a surgeon that may be able to help RoseLisa with her condition. You will probably be able to follow this up on Lori's blog at a later date. 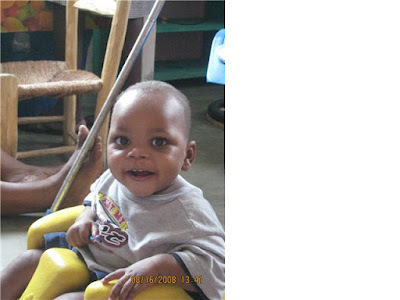 At long last, here is an update on the triplets we received on July 29, 2008. We are sorry for the delay because we know so many of you have been asking about them and praying for them. We have been so busy taking care of them that it is only now that we have had any time to introduce them to you! As we have no infant monitors, the triplets required 24-hour observation during the first two weeks. Melinda, Valdo and I took three hour shifts throughout each night during this time, and I continue to do the night shift now. The above picture is of Paulentzka. She weighed 1.3 kilograms (just over 2 lbs) when she was brought to us. 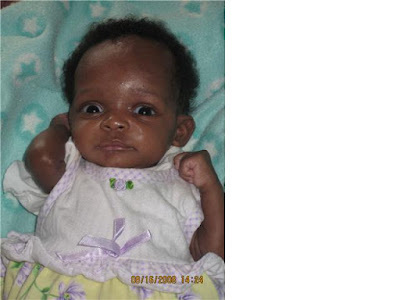 She and her siblings were born eight weeks early. During the first two weeks with us she had two episodes of respiratory distress (i.e., she actually stopped breathing), which required rescue breathing. She was on oxygen and prolonged IV treatment. 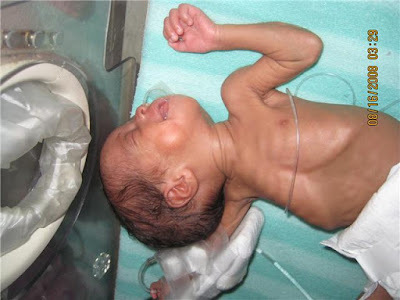 Because of her critical condition she actually lost weight, but is now back up to her birth weight. She is currently doing very well and is able to take one ounce of milk every three hours. This is Valentzka. She was the first born of her siblings, and was the tiniest at 1.25 kilograms. She has been the most unstable of the three. 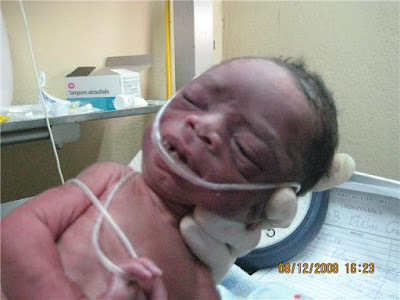 She was not breathing when born, and was on oxygen for her first three weeks. 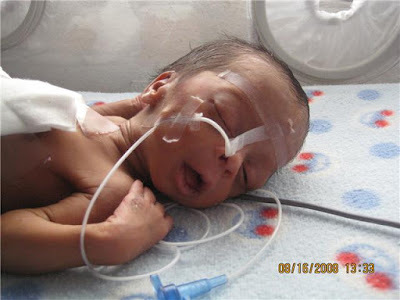 She has had a lot of bowel issues, which can be fatal for premature infants. She is still on IVs, and is not able to take in She is being tube fed 5 cc's (approximately 1 teaspoon) every three hours. Her body temperature is unstable, constantly dropping and requiring her to be on the warming table. She remains in serious condition and needs your prayers. This is Viventz, brother to his two sisters. He was originally the strongest of the three -- and largest, at 1.5 kgs -- but in the first week he quit breathing once and had a severe infection with jaundice (yellowing of the skin). During this time he became very weak, and for several days we were very concerned whether he was going to survive. The infection has now resolved, however, and he is taking one ounce of formula every three hours and gaining back the weigh that he lost. Thank you so much for praying for these little ones. We are happy to report that Paulentzka and Viventz are now stable. Please continue praying for Valentzka in particular, given her serious condition, and that all three remain free from infection. I am in my element watching these babies not only survive, but begin to thrive as little people.